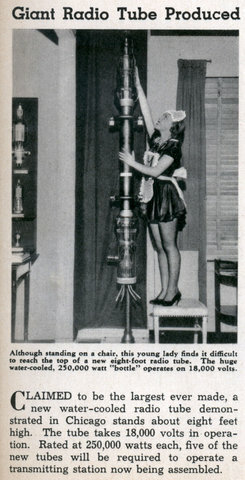 CLAIMED to be the largest ever made, a new water-cooled radio tube demonstrated in Chicago stands about eight feet high. The tube takes 18,000 volts in operation. Rated at 250,000 watts each, five of the new tubes will be required to operate a transmitting station now being assembled. And the lady is in a french maid costume because…? Because you don’t need a reason for a woman in a French Maid outfit. If you let your tubes get dusty, they give off that yucky burnt dust smell every time you power up. So you gotta have a maid.